The Phactor is an excellent source for advice on lawn care. chloroplasts are housed within a grass or creeping Charlie? Lesson 2: Minimize lawn area. You can’t eat grass, so transform as much lawn as possible into gardens. Big beds of perennials will relieve lawn boredom and in the long run take much less work. You’ll be able to trade in that big honking Peterbilt riding lawn mower (you need the exercise of walking anyways) for a funky garden bench with a matching table upon which to place your margarita. Lesson 3: Never, ever fertilize your lawn! Nutrients just make the grass grow and then you have to mow it. It’s a nasty cycle. Lesson 4: Never, ever water your lawn! Didn’t you get the idea of Lesson 3? Don’t be a slow learner; the idea is to avoid mowing. Besides grass is supposed to turn brown and go dormant in hot, dry summers. Your neighbors probably don’t know this and they would appreciate the information. Lead by example; suburbia will raise a statue (or is that a statute?) in your honor. Lesson 6: Start writing a book. If anyone complains about your minimalist lawn care, simply counter by saying, with a slightly affected tone, “My book writing doesn’t leave time for things like lawn care.” This immediately puts the complainer on the defensive; what have they ever written? This has been working for the Phactor for about 10 years now and counting (hope my editor doesn’t see this). Lesson 7: Plant lots of trees. Grass doesn’t grow well under trees so you can plant ferns and shady wildflowers and never, ever mow again. But don’t throw that old lawnmower away; they are pretty useful for chopping up leaves each fall which you apply as mulch. Coming soon to this blog. How to get sponsorship for your gardening blog. A vision of lurid loveliness! In several places rampant vines intertwine and climb their way to our greenhouse’s roof, so visitors are often surprised by this huge, dangling, head-high flower. Top to bottom this flower is about 12 inches of lurid, ghastly loveliness, especially if you have the delicate sensibilities of flies. 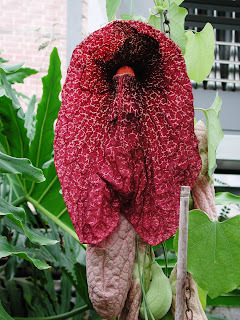 The plant is Aristolochia gigantea. Members of this genus are often called “birthworts”, and were thought to aid in childbirth (from the Greek for best (aristos) and childbirth (lochia)). Such names were derived from ancient concepts of like cures like, sometimes referred to as the doctrine of signatures, meaning that the creator in their wisdom indicated what plants such as this were good for by leaving a “sign”, a similarity to some body part. For pollination these plants generally trap flies or similar insects lured by odors (and appearance) of carrion, rotting flesh. The trap consists of a sharply bent tubular portion of the corolla, unseen in this image, lined with wrong-way pointing hairs, so it’s easy to crawl in but impossible to crawl out. Supposedly this resembles a fetus in the correct position for birth, and with the vaginal appearance of the corolla, this accounts for the common name, and its supposed connection to childbirth. Although common in herbal medicines of the world, The Phactor does not recommend adding birthworts to your medicine cabinet because of their toxicity. Herbs and spices have long been considered essential in many cuisines adding interest and flavor to otherwise bland and boring food. Cereal grain endosperm and starchy staples such as potato and cassava make up the overwhelming majority of human calories, but they come up short in terms of taste. My modestly-hot, award-winning chili almost killed one of my colleagues of Scandinavian descent. An obvious observation is that spicier cuisines are found closer to the Equator. But why is this so? Are people from tropical cultures used to spiciness because most spices are from tropical plants? In study after study, spices are found to have medicinal benefits. The most commonly used spices of the lower latitudes consistently have the highest antimicrobial activity. So in hot climates, especially before the widespread use of refrigeration, cultures that used the most spices ate the safest food. People who liked spicy food were healthiest. So the whole thing makes biological sense. Where spices were rare and expensive, and where food was not such a health risk, people learned to like bland. A chemical in turmeric (yellow powder, upper left) seems beneficial in helping the immune system deal with Alzheimer’s disease. And now another chemical in turmeric, a member of the ginger family, relieves bowel inflammation and may be useful in treating Crohn’s disease. I post this to curry favor with my F1. The essential oils largely responsible for spices’ flavors have long been known to have medicinal qualities, although determining the precise compound, and then safe and effective doses, requires scientific study, something oft overlooked by herbal fanatics. Understand, these are toxic compounds (used in the broad sense of that term) but the amounts in spices when used in food level doses are harmless. No question about it, you can OD on nutmeg, but consumption of spices can be considered part of a healthy lifestyle. And who wants bland anyways? Oh, yes, my Scandinavian colleague. The Phactor remembers the first Earth Day in 1970; he was a senior in college and that does date him even if he was a bit precocious. Unfortunately it did not receive as much attention that year as it should have because there were so many distractions that revolved around anti-war protests (Vietnam), trying to graduate, and thinking seriously about a long-time girl friend. In trying to think of something profound to say, I find myself simply saddened by the state of the Earth. The whole panoply of environmental issues always ends up being argued from a political perspective, but the ecological perspective is quite clear. Our species has exceeded the carrying capacity of our environment. Humans began the path to the present day when they stopped living as gatherers and hunters and shifted to making a living via agriculture. This is not an indictment, just history. My own particular role in this has been the simple, but not always easy task of helping students understand how nature works and the place of humans in all of this, so that they may use that knowledge to make wise decisions. Of course the flaw in that is the assumption that knowing something is important to making decisions, which often has not been the case in politics. When ideology trumps knowledge it all goes out the window. A great deal of the Earth’s natural communities have been altered, damaged, or destroyed, but there still remains a resilience that gives the Phactor some hope if we can abate the rate of destruction. Unfortunately so many people are so estranged from nature, from their food and resources, it creates an ignorance or indifference to the natural order of things. People just don’t know, care, or understand what living their lives is doing, insulated as they are by human technology. In the words of Porky Pine penned for Earth Day by the great Walt Kelly, "We have met the enemy, and he is us." Being ethical demands that our actions not harm others, and that principle must be extended to actions that do not unduly harm the ability of our environment to sustain us. So be mindful of the full impact we make, both on our own personal little hummock, and elsewhere, and try to help others know why it’s important to have a "green" ethic, otherwise you become an enemy of people. PS Many people attribute that quote to Pogo because of an Earth Day poster made by Kelly a year later, but he didn't say it in the original cartoon. Pardon me for indulging in a bit of political reminiscence. The GOP’s and conservative pundits’ reactions to the 1st 100 days of the Obama presidency have been something to behold, and I have been hard pressed to find any words to describe these events. “Sour grapes” was botanical enough, but that seems far too mild for the shrill tone and the bitterness of the flavor. Ah, but then it came to me from the deep recesses of my political memory, Obama is being hounded by "nattering nabobs of negativity". For those of you too young to remember, this wonderful bit of alliteration was penned by speechwriter William Safire and used by former Vice President, Spiro Agnew to describe the "liberal" media. Agnew had reason to down on the press. The Nixon administration was nearly as devoted to secrecy as W’s, and Agnew was eventually convicted of tax evasion and money laundering in connection to bribes he took as governor of Maryland. The bitter negativity, the shrillness, the aggressiveness, the absurdity of their claims, and the dangerous divisiveness of today's right-wing commentators and politicians, were all pioneered by Agnew. Anyone who questioned the policies of the Nixon administration and the war in Vietnam were “enemies” of the state and branded communists or hippies, more or less depending upon your age. Take it from a hippy who was there, today’s right-wing rhetoric is not a return to the good old days. OK, quick tomato growers quiz. What's wrong with these tomato plants? Nothing actually; they are normal enough tomato seeds sprouting normal enough tomato plants. What makes them unusual is that they are sprouting from inside an intact tomato fruit, and you don't see this happen very often. 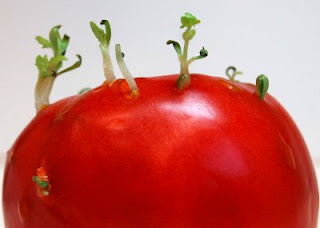 Like many plants, seeds inside tomatoes are inhibited from germinating. Fleshy fruits function by attracting and rewarding animal seed dispersers, and they broadly fall into two categories: fruits with many small seed and fruits with few, large-seeds. The former get eaten with the fruit, pass through the GI tract unscathed, and get deposited in a nitrogen rich environment ready to grow. Some seeds actually require passage through the GI tract to readily germinate. The seeds are numerous enough that while a few get destroyed by chewing, the majority get swallowed intact. And the digestion process removes the inhibiting tissue from around the seed, and may even render the seed coat more permeable. When seeds get larger, animal dispersers like ourselves generally pick them out and discard them rather than swallowing them. Something about the size of a watermelon seed is about the break point on swallowing versus picking out. Fruits with big seeds (grapefruit) or pits (inner part of fruit with enclosed seed) like peaches and mangos are no brainers. You can follow fruit eating monkeys through a rainforest and see, based on what they drop and defecate (don't follow too closely), that their choices are very similar to yours. For some reason, probably having something to do with the way it was stored, the environmental conditions overroad the inhibitors and kicked these tomato seeds into premature germination, so here they are growing their way out of the fruit. HT to a curious botanical colleague. Seeds are perhaps the most misunderstood and misinterpreted of botanical subjects. You plant a radish seed, a radish grows, flowers, gets pollinated, fruits, and the seeds within contain an embryonic radish plant. This seems simple enough, rather like chickens. In fact the traditional name for an immature seed at the time of pollination is an ovule, literally an egg. So of course the floral structure that houses ovules must be an ovary. Oh so very like an animal, NOT! An ovule is actually a sporangium, a jacketed, unopening sporangium that produces 1 spore via meiosis thus reducing the chromosome number from diploid to haploid. The spore develops into a female organism, a gametophyte, that ultimately produces a real egg. Pollen is also a spore at its inception, and it too develops into a haploid male organism, albeit a very tiny and reduced fellow. Having a small dispersible male solves the swimming-sperm problem that land plants with free-living gametophytes have, e.g., ferns. Pollination is the completion of the male’s dispersal trip. A pollen tube that grows from him to her delivers the sperm, fertilizes the egg, and results in a new embryo. When the entire kit and caboodle is mature, the jacketed sporangium, what’s left of the female, and the resulting embryo of a new diploid plant (a sporophyte) gets dispersed as a seed. The seed plant life cycle only makes sense as an evolutionary solution to a reproductive problem that limited the distribution of land plants. Here are some great false color images of seeds and pollen complements of the Royal Botanical Garden at Kew. HT to DD at Neuron Culture. A recent article provides 10 reasons for planting your own garden: preserving seed diversity, self sufficiency, thoughtful gifts, exercise, cut fossil fuel use, save time, lessons for kids, nutrition, harvesting, save money. The Phactor finds most of these completely unrealistic and even a bit naïve. Come on this is the best they could do? Who plants a garden to have thoughtful gifts? Giving away excess zucchini is hardly thoughtful. Maybe throwing an over-ripe tomato at your neighbors' barking dog might count as thoughtful , from a certain perspective. Makes you wonder if the author of this article gardens? Real gardeners aren’t motivated by such reasons, so here’s the Phactor’s 10 reasons for why you should have a garden. Reality check – Gardens provide a means of keeping in touch with reality. You watch plants sprout, grow, prosper or dwindle, and die. Some things do well, others flop. That’s life in a microcosm. Taste – Fresh from the garden fruits and veggies tastes so much better than the aged offerings in stores. Only farmer’s markets come close. I doubt there is actually any significant nutritional difference, but who cares. Berries – Nothing is better than fresh berries, other than value added berries, like a berry pie, especially for breakfast. If you don’t understand this refer back to taste, and of course, marry someone who knows how to bake a pie. Weather – Gardening puts you in touch with the weather more than any other activity, other than maybe sailing, but that’s hard to verify here in Lincolnland. Highs, lows, rainfall, storms all begin to matter in ways you never noticed before. If you don’t understand refer back to reality check. Asparagus – Nothing says spring more than fresh asparagus. Oh, this stuff is what it’s all about. Asparagus grows well along fences and borders, but plant it far enough inside your lot that your neighbor can’t reach it. Check the link to improve on something that doesn’t need improvement. Snap peas – Yes, your kids may decide it’s fun to watch things grow (mine didn’t), and it may be a way to teach them to eat better, but I recommend not even giving kids the good stuff. They’re happy with McNuggets, so why share something as good as snap peas with the little ingrates? Bragging rights – Gardeners really really like to brag about how big this grew, how many peppers they got, how early their first tomato was. It’s like comparing gold scores, except golf is the antithesis of gardening, unless you go to pick raspberries along the edge of the fairways, and I grew more anyways. Vine ripe tomatoes – Tomatoes purchased from a store are indistinguishable from red plastic. Lightly toast buttered slices of a baguette under a broiler. Rub them with the cut surface of a garlic clove, and the surface of a dead-ripe just-picked warm-from-the-sun tomato. Toast just a bit more. Eat this toast with a glass of cold bone-dry Spanish champagne. Don’t understand? Refer back to taste. Then go get yourself some McNuggets. Hmm, that’s 8 reasons. But what does it matter? You shouldn’t need any more stinkin’ reasons; gardening is just what the best people do, no matter what, no matter where! Maybe some real gardeners can suggest a couple reasons more. Spring here in Lincolnland in the great American Midwest is more of a concept, a theoretical construct, than a reality. As if to prove my point nature provided our flowering bulbs and climatically stupid star magnolias with a snow covering and now plans to back up wintery threats with temperatures several degrees below freezing. And that’s the way it is here as often as not. Enough mild weather emerges from the cocoons of spring to raise your hopes and expectations with green buds and early flowers only to have them dashed down by one more cold front marching eastward like a chilly army bent on defeating spring. No actual spring occurs here really. Just warring fronts, pushing back and forth, first mild, then bitter, back and forth again, and the war continues until suddenly one day in mid-May summer pushes through and exhausted by all the charging and retreating rests for five months. The weather war is repeated with the opposite outcome in November after summer hangs on well into October. It’s no wonder that those folks who live lives insulated from the reality of nature simply switch the thermostat from heat to cool without opening nary a window. And I know they do this because I’ve bought their houses and struggled to reopen windows painted shut all those years ago when central air was installed. But no matter how buffered they are, I can’t live that way, so I fall for it every year. I emerge with the first whiff of mild weather to plant and prune and coax with the hopes of a spring and they get buried in a funeral shroud of white snow. Is there anything sadder than a magnolia festooned with drooping brown flowers? And the Phactor knows it’s really our fault for planting them too far north, but the alternative, to live without them, is unthinkable, and so for this reason the movement to landscape with only native plants will fail to capture my heart or enthusiasm. So you live for that one year in two, or three, if we are fortunate, that the magnolias will burst forth in flower without any critcal comment from old man winter. What's left Tuesday will struggle back, sprouting up from its base, defiant. And the tough plants will once again show their toughness, their raison d'etre for being, yet, I think I shall provide my little coldframe with a bit of thermal assistance tonight, and we may yet enjoy some salad before May. Spring means the return of all your plants, at least those that survived the -20F winter low. While many people think of spring flowers as delicate things, most early flowering plants are tough, and they have to be to deal with spring weather here in Lincolnland. Lesson 2 in knowing your genera will feature a classic early spring flower, the hellebore, Helleborus. OK, the common name and genus name are not quite identical, but close enough to fit my theme. Helleborus is an old world genus of the buttercup family, and many members of this family are known for their cold hardiness and early flowering. The genus is not known as well in North America and is seldom planted by anyone but the avid gardener, although hellebores are very common in European gardens. Pronunciation is hell-eh-BOH-rus. The tough leathery leaves over winter and new shoots bearing nodding flowers appear very early in the spring. They are often subjected to over night freezes without apparent harm. One species, Helleborus niger is called the Lenten rose; the flowers open white and turn pink after they are pollinated, so the biology does not quite fit the religious symbolism intended. Hellebore flowers are among the largest of early spring plants at 7-8 cm in diameter. The flowers have a single whorl of perianth, usually called petals because they are showy, but technically they aren't, and a large number of helically arranged stamens and pistils. After pollination the perianth persists around the developing fruitlets for a long-lasting display. Altogether this is a very typical flower for the buttercup family. The plants are a bit slow to establish and they do not like disturbance, but left along in a semi-shady area, they can provide a great spring display. Hellebores are toxic so rabbits and deer leave them alone. The Phactor has an extensive list of plants rabbits like in rank order of preference. The data is obtained by caging something the rabbits ate, and then you find out what in your garden they like next best, then you cage that and so on down the list. At times this becomes and expensive experiment. The semester is progressing, and the Phactor is pretty much on schedule in one of his favorite classes, which makes me wonder what I inadvertently left out , and the third exam is coming up. Now it takes a couple of hours to write a good exam; no multiple guess questions, just queries, explanations, and hypotheses to evaluate on blank paper. But evaluating these exams, carefully and fairly, even for a class of just 24, takes hours and hours. And after the first two exams it's mostly it's a waste of time. This assertion is based upon a couple of decades of data. After two exams grades can be assigned with about 85% accuracy. The senior sliders have identified themselves, as have those students who do not miss a trick. There is little chance either group will change. However a couple of those in the middle will continue to improve, and every now and then the wheels completely fall off for someone, usually the result of something in their personal lives that affects their academics, and the results are a real tragedy. But the assessment for most is accurate after just two samples. However the sampling will continue, and presumably the assessment will asymptotically improve its accuracy.